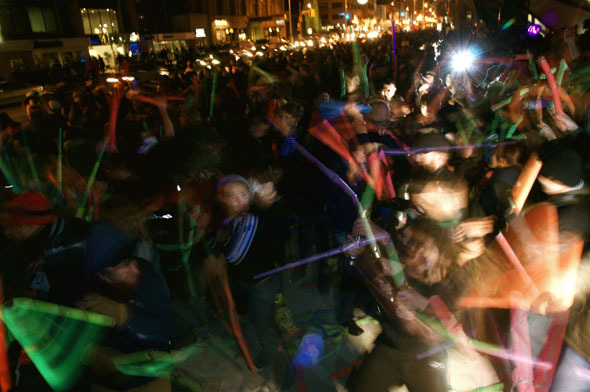 A Toronto lightsabre fight – one of many weirdly-themed public parties (cf. pillow fights and bubble blowing) that have made our bland city a little less staid recently. I was indisposed in Europe when this occurred, or else… Well, I probably still wouldn’t have gone. But I could’ve laughed at this awesome picture earlier! *thwack thwack thwack* What I wouldn’t have given to see video, so I could hear all the participants adding their lightsabre-thrum sound effects to the proceedings! This entry was posted in Restaurants and tagged hee-hee, Restaurants, trawna, whimsy, wtf. Bookmark the permalink. Post a comment or leave a trackback: Trackback URL.